Art directors are constantly on the lookout for new ideas, and with this art director email database, you can market yours to these decision-makers quickly using accurate contact information such as real names, direct email addresses, phone numbers, and more! Art directors have a lot of responsibility on their shoulders: Their vision shapes the overall look and feel of an ad campaign, a publication, or the set of a live performance. The work of an art director can make or break their employer's efforts, so they can use all of the help they can get to come up with great ideas and bring them to fruition. That's where your businesses can come in, and if you can make an art director's job easier, they'll certainly be glad that you told them using this targeted art director mailing list. No matter how you prefer to conduct your marketing campaign, Bookyourdata.com has the information you need to bolster its success. 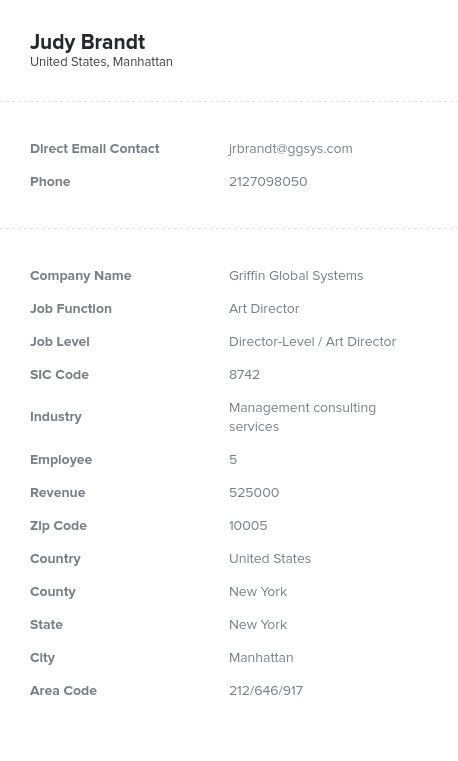 Cold-call art directors using the verified phone numbers we provide. Email leads with our accurate, direct email addresses. You might even want to engage in a B2B direct mail campaign to send samples of your products using the mailing addresses that we provide in this business database. No matter what your approach might be, with this premium art director email list, it's sure to be more successful. In fact, we even offer a deliverability guarantee: We're so confident in the quality of our sales leads that if more that 5 percent of your messages bounce back, we'll make up the difference. Experience the difference when you reach out to art directors with Bookyourdata.com today!